We took a short road trip west to a place called Hornings Hideout yesterday. My brother-in-law and his fiance are planning on getting married at the property next year, and we went to check it out. There are tons of peacocks at the place, and we even saw babies. But there is nothing more impressive than a male with his feathers out. The colors on this guy seriously popped! Love this bird.. so beautiful and such awesome colors. Have a great week. They are special when they display. Thanks for joining in to Blue Monday, Sarah. One thing about this guy, he knows how to strut his blues. Gorgeous! I played too. Mine are here and here. Beautiful, great photo too. I bet it will be a great place to have a wedding. Wow! That puts a whole new spin on the idea of fanfare! That is a fan with flair! They are simply beautiful and amazing creatures. How lucky you were to catch one displaying his feathers!!! 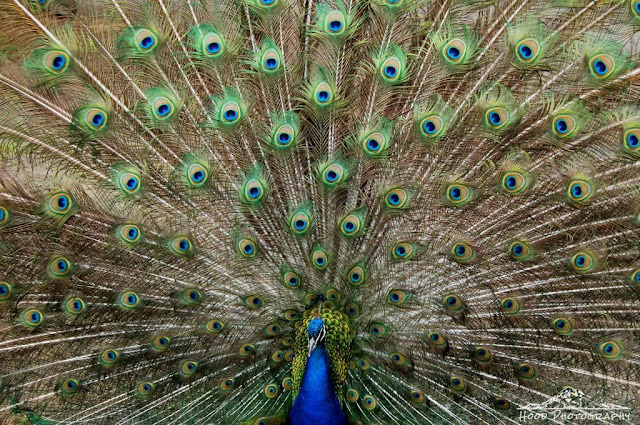 I've seen many, but never one in person with a full feather display like this one!!! Beware at the upcoming wedding though...I was once dive bombed by one at the zoo in LA!!! They can fly...and they can land with a thud!! !